Birmingham City stretched their unbeaten Premier League run to six games after a fine second-half comeback gave them a first away win at Wigan. Charles N'Zogbia opened the scoring for the Latics with a curling effort after good hold up play by Jason Scotland. But Birmingham hit back after the break as Sebastian Larsson converted a brace of free-kicks either side of a breakaway goal by Christian Benitez. Substitute Jordi Gomez pulled one back for Wigan with a late free-kick. 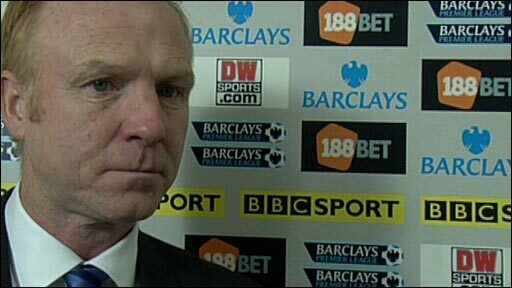 Birmingham's third successive win, which propels them to eighth in the Premier League, was a tribute to the character instilled in the team by manager Alex McLeish, who galvanised his players to magnificent effect after a dominant first-half display by Wigan. The Latics' 1-0 win over Sunderland last weekend had applied a salve to the psychological wounds inflicted by that 9-1 drubbing at Tottenham just under a fortnight ago, but Birmingham's resilience ended their hopes of a second successive restorative result. Defensive parsimony has been central to Birmingham's recent success, but their hopes of claiming a third successive clean sheet were punctured shortly after the half-hour mark, when Scotland's cut-back found N'Zogbia just inside the area. Skipping inside left-back Liam Ridgewell, the former Newcastle man still had much to do but rose to the challenge superbly, curling an exquisite effort high into the top right-hand corner of Joe Hart's net. The goal created further disquiet in a Birmingham defence that had been rattled early on when Roger Johnson was left with a bloody nose after contesting a high ball with Hugo Rodallega. Incensed by the challenge, for which the Colombian was booked by referee Lee Probert despite the absence of any evidence to support Birmingham claims of an elbowing offence, Johnson subsequently went in hard on Paul Scharner and had to be repeatedly calmed. Probert came in for further scrutiny when Birmingham midfielder Lee Bowyer was denied a credible penalty claim after his goal-bound shot struck the raised arm of Mohamed Diame. Wigan goalkeeper Chris Kirkland, who drew lavish praise from manager Roberto Martinez last weekend, fell victim to a recurring back injury in the wake of that attack, and his subsequent withdrawal set the scene for a torrid afternoon for the home side. Substitute keeper Mike Pollitt was immediately called into action, saving well from Benitez, and although Wigan finished the half strongly the initiative was to change hands permanently after the break. Defensive fallibility has been among the few consistent features of Wigan's season, and when Larsson took a free-kick from a position deep on Birmingham's left flank, that vulnerability reared its head again, the ball clearing a packed penalty area to creep beyond Pollitt. If there was a touch of fortune about the goal, there was nothing lucky about the Sweden international's next dead-ball effort, a wickedly curled free-kick from just outside the area that left Pollitt grasping at air. By then Birmingham were already ahead, fired in front by Benitez after the Ecuador international had latched on to Bowyer's long pass before out-pacing Titus Bramble. Wigan substitute Gomez scored with an 88th-minute free-kick to set up a tense finale, but the Latics' form continues on the same unpredictable trajectory that has combined impressive wins against Chelsea and Aston Villa with abject humiliation at the hands of Spurs. Birmingham, on the other hand - unbeaten since mid-October, buoyed by the prospect of a generous January transfer budget from new owner Carson Yeung, and now with three wins in a row - go from strength-to-strength. "It is difficult to explain how we lost the game, we created chance after chance and dominated the first half. 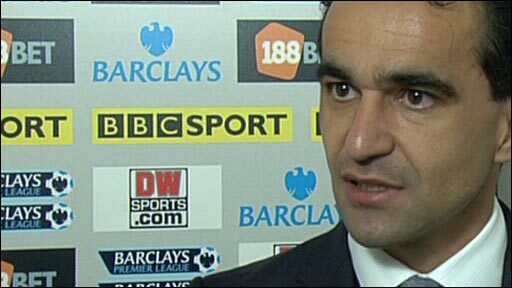 "With the football we showed in the first half we should have got something from the game, we were well in control. "But we didn't show character in our play, and too many times this season we have folded in adversity. "We reacted in the last 15 minutes, probably more with heart than head, but we need to put our weaknesses right." "We're showing we belong in Premier League, the players are entitled to feel massively confident because they've earned it. "Since the start of the season they have been resilient, bounced back from setbacks in any given game, and they've got their rewards. "I thought we let Wigan bully us a little in the first half, so I asked the players to get a little closer to people and stop them making passes. "We were a much more dangerous proposition in the second half, we upped our game and some players took it by the scruff of the neck. "I felt if we could get a goal we could go on and win it, and we got what we deserved in the end." 90:00+3:04 The referee blows his whistle to end the game. 90:00+2:37 James McFadden is ruled offside. Indirect free kick taken by Michael Pollitt. 90:00+1:20 Free kick awarded for an unfair challenge on Roger Johnson by Titus Bramble. Joe Hart takes the free kick. 88:23 GOAL - Jordi Gomez:Wigan 2 - 3 Birmingham Jordi Gomez grabs a goal direct from the free kick from just outside the penalty area to the bottom right corner of the goal. Wigan 2-3 Birmingham. 87:20 Handball decision goes against Roger Johnson. 85:15 Charles N'Zogbia crosses the ball, save by Joe Hart. 84:19 Hugo Rodallega takes a shot. Save by Joe Hart. 83:57 Unfair challenge on Charles N'Zogbia by Liam Ridgewell results in a free kick. Direct free kick taken by Charles N'Zogbia. 83:24 The referee blows for offside. Indirect free kick taken by Mario Melchiot. Correction - 82:52 Effort from the edge of the penalty box by Hugo Rodallega goes wide of the right-hand upright. 82:52 Jordi Gomez has an effort at goal from the edge of the box that misses to the right of the target. 81:16 Free kick awarded for a foul by Liam Ridgewell on Hendry Thomas. Direct free kick taken by Mario Melchiot. 80:30 Substitution Keith Fahey joins the action as a substitute, replacing Cameron Jerome. 80:01 Jordi Gomez gives away a free kick for an unfair challenge on Lee Bowyer. Barry Ferguson takes the direct free kick. 78:13 Effort on goal by Scott Sinclair from just outside the penalty area goes harmlessly over the target. 75:53 Substitution Jordi Gomez is brought on as a substitute for Emmerson Boyce. 74:38 James McFadden takes the free kick. 74:38 Booking Hendry Thomas receives a yellow card for unsporting behaviour. 74:24 Christian Benitez fouled by Hendry Thomas, the ref awards a free kick. 71:45 GOAL - Sebastian Larsson:Wigan 1 - 3 Birmingham Sebastian Larsson hits the back of the net with a goal direct from the free kick from just outside the penalty area to the top left corner of the goal. Wigan 1-3 Birmingham. 70:27 Titus Bramble gives away a free kick for an unfair challenge on Cameron Jerome. 69:00 Substitution Scott Sinclair on for Mohamed Diame. 66:55 James McFadden gives away a free kick for an unfair challenge on Paul Scharner. Charles N'Zogbia sends in a cross, Emmerson Boyce has an effort at goal from deep inside the area missing to the left of the target. 65:10 The assist for the goal came from Lee Bowyer. 65:10 GOAL - Christian Benitez:Wigan 1 - 2 Birmingham Christian Benitez fires in a goal from just inside the area to the bottom right corner of the goal. Wigan 1-2 Birmingham. 64:07 Cameron Jerome takes a shot. Blocked by Emmerson Boyce. James McFadden takes the outswinging corner, clearance by Hendry Thomas. 63:13 Unfair challenge on Maynor Figueroa by James McFadden results in a free kick. Titus Bramble takes the direct free kick. 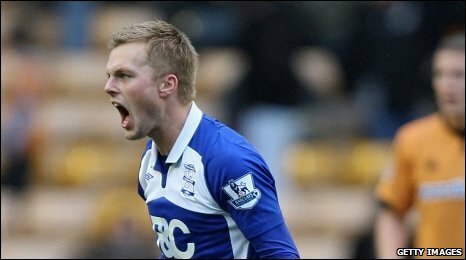 60:27 GOAL - Sebastian Larsson:Wigan 1 - 1 Birmingham Sebastian Larsson scores a goal direct from the free kick from long distance to the bottom right corner of the goal. Wigan 1-1 Birmingham. 59:38 Hendry Thomas concedes a free kick for a foul on Lee Bowyer. 58:44 Paul Scharner concedes a free kick for a foul on Lee Bowyer. Scott Dann takes the free kick. 56:22 Charles N'Zogbia takes a shot. Joe Hart makes a save. Charles N'Zogbia takes a corner. 52:53 Hendry Thomas challenges James McFadden unfairly and gives away a free kick. Sebastian Larsson delivers the ball from the free kick right-footed from left channel, Michael Pollitt makes a save. 50:18 Hendry Thomas concedes a free kick for a foul on Liam Ridgewell. Scott Dann takes the free kick. Correction - 49:49 Jason Scotland takes a shot from just outside the penalty area which clears the crossbar. 49:49 Shot from just outside the area by Jason Scotland goes over the bar. 49:21 The ball is delivered by Hugo Rodallega. 49:00 Scott Dann takes a shot. Blocked by Titus Bramble. 48:43 Short corner taken by James McFadden from the right by-line. Correction - 48:23 Cameron Jerome takes a shot. Save by Michael Pollitt. 48:23 Cameron Jerome takes a shot. Mario Melchiot makes a save. Correction - 45:17 Shot by Cameron Jerome. Save by Michael Pollitt. 45:17 Shot by Cameron Jerome from 12 yards. Save by Mario Melchiot. 45:00+2:04 The first half comes to an end. 45:00+1:27 Hugo Rodallega takes a shot. Save by Joe Hart. 44:28 Hugo Rodallega takes a shot. Save by Joe Hart. Corner taken by Hugo Rodallega from the left by-line, Headed effort on goal by Emmerson Boyce from inside the penalty box misses to the right of the target. 42:47 Paul Scharner takes a shot. Joe Hart makes a save. 41:10 Emmerson Boyce has shot on goal from just outside the area which goes wide of the right-hand upright. 40:30 The official flags Jason Scotland offside. Joe Hart restarts play with the free kick. 39:07 James McFadden gives away a free kick for an unfair challenge on Mario Melchiot. Strike comes in from Charles N'Zogbia from the free kick, save made by Joe Hart. 38:03 Free kick awarded for an unfair challenge on Hendry Thomas by Cameron Jerome. Free kick taken by Titus Bramble. Correction - 36:24 Paul Scharner takes a shot. Save by Michael Pollitt. 36:24 Paul Scharner takes a shot. Mario Melchiot makes a save. 35:50 James McFadden takes a shot. Save by Michael Pollitt. 32:27 Assist by Jason Scotland. 32:27 GOAL - Charles N'Zogbia:Wigan 1 - 0 Birmingham Charles N'Zogbia finds the net with a goal from the edge of the penalty box to the top left corner of the goal. Wigan 1-0 Birmingham. 29:27 Foul by Hugo Rodallega on Stephen Carr, free kick awarded. Joe Hart restarts play with the free kick. 28:42 Shot by Christian Benitez from deep inside the penalty area misses to the right of the target. 26:34 Effort on goal by Hugo Rodallega from inside the area goes harmlessly over the bar. 25:25 Free kick awarded for an unfair challenge on Mohamed Diame by Lee Bowyer. Free kick taken by Titus Bramble. Correction - 24:44 The referee blows for offside against Roger Johnson. Free kick taken by Michael Pollitt. 24:44 The referee blows for offside. Indirect free kick taken by Mario Melchiot. 22:55 James McFadden restarts play with the free kick. 22:55 Substitution Chris Kirkland goes off and Michael Pollitt comes on. 22:55 Mohamed Diame challenges Sebastian Larsson unfairly and gives away a free kick. 21:28 Foul by Roger Johnson on Paul Scharner, free kick awarded. Charles N'Zogbia crosses the ball in from the free kick. 18:42 Drilled left-footed shot by Lee Bowyer. Blocked by Mohamed Diame. 18:02 Free kick awarded for an unfair challenge on Sebastian Larsson by Mario Melchiot. Liam Ridgewell takes the direct free kick. 16:40 Effort on goal by Paul Scharner from just inside the penalty box goes harmlessly over the target. 14:33 Joe Hart takes the free kick. 14:33 Booking Hugo Rodallega is shown a yellow card for unsporting behaviour. 14:02 Free kick awarded for an unfair challenge on Roger Johnson by Hugo Rodallega. 11:32 Paul Scharner concedes a free kick for a foul on James McFadden. Free kick taken by Stephen Carr. 4:12 Charles N'Zogbia gives away a free kick for an unfair challenge on Liam Ridgewell. Joe Hart takes the free kick. 3:29 Christian Benitez is caught offside. Titus Bramble takes the free kick. 2:37 Paul Scharner produces a right-footed shot from deep inside the penalty box which goes wide of the left-hand post. 0:52 Christian Benitez is penalised for handball and concedes a free kick. Free kick taken by Chris Kirkland.